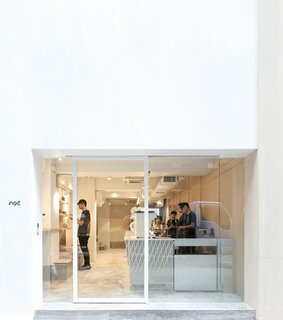 Just steps from Hong Kong's bustling Central district, NOC Coffee Company's second branch receives a minimalist and sophisticated transformation by Hong Kong-based design agency, Studio Adjective. Instead of creating a dramatic exterior that would be forced to compete with the street’s busy urban scene, Studio Adjective opted to create contrast with a glass facade—highlighting the interiors and showcasing the 23-foot-long coffee bar. 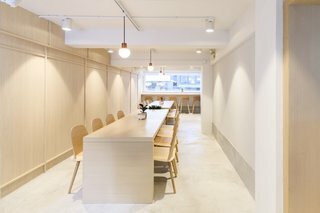 The use of bright white surfaces and washed-oak wall panels add a clean veneer, while customized details keep the space cozy, including a platform seating nook that extends from the polished cement floor. However, the star of the show is the bespoke coffee bar. 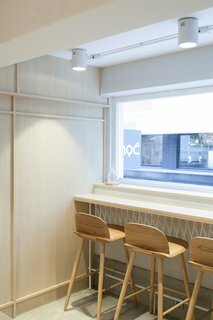 Custom-made by Studio Adjective, the counter is topped with white Corian and decorated with a double-layered, striped pattern made with angled pieces of white metal. It serves as the perfect stage for Noc's baristas to showcase their carefully honed talents. 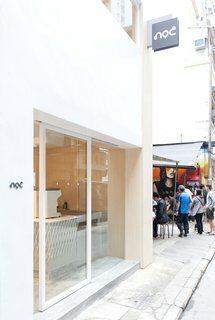 The minimalist facade of Noc Coffee Co. on Gough Street sets it apart from the busy, urban street scene. 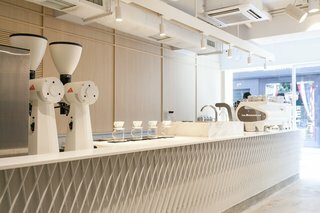 Custom-made by Studio Adjective, the 23-foot-long coffee bar is topped with a white Corian counter. 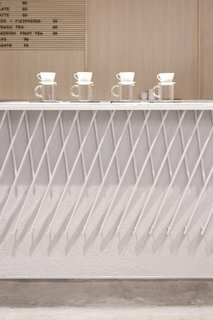 The front of the coffee bar features a decorative armor made out of angled pieces of white-painted metal that form a criss-cross pattern. 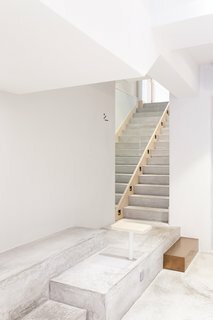 The cement floor in front of the bar becomes a multi-tier platform seating area. 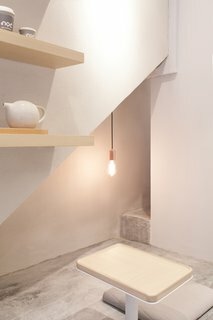 A cement staircase leads customers to additional seating on the second floor. The cozy seating nooks are perfect for enjoying a cup of coffee and a book. 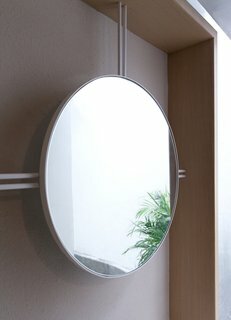 Studio Adjective made custom furniture and mirrors specifically for Noc Coffee's Gough Street location. The second floor features two communal tables that can be pushed together to form one long table for special events. Bar seating by the window makes for excellent people watching.